Those awaiting results of October 25, 2015 National Police Commission (NAPOLCOM) exam for the Philippine National Police (PNP) entrance and promotional examinations can find here the complete list of passers and top 20 as the commission released results in 2-3 months after the exam. FIRST UPDATE: October 2015 NAPOLCOM exam results for PNP entrance and promotional exams (Police Officer and Senior Police Officer) out on Friday, January 8, 2016. SECOND UPDATE: Promotional exam results for Superintendent and Police Inspector were released online on Friday, February 12. NAPOLCOM administered the PNP entrace and promotional exam to a total of 34,919 examinees in at least 24 testing centers nationwide namely: cities of Makati, San Fernando (La Union), Tuguegarao, Angeles (Pampanga), Cabanatuan, Malolos (Bulacan), Aurora (Baler), Tarlac, Calamba, Bacoor, Calapan, Legazpi, Iloilo, Cebu, Tacloban, Pagadian, Dipolog, Cagayan de Oro, Davao, Mati (Davao), Koronadal, Baguio, Butuan and Cotabato. A total of 14,860 tried to hurldle the PNP entrance exam while 20,059 took the various promotional categories which include Superintendent, Police Inspector, Senior Police Officer and Police Officer exam. The big chunk of examinees came from the National Capital Region (NCR) with 1,300 out of the 14,860 examinees for the PNP entrance test and 2,431 out of the 20,059 police examinees for promotional exams. The three-hour entrance examination for PNP entrace covered questions on general information, verbal reasoning, quantitative reasoning and logical reasoning; while the promotional examinations include general information, police administration and operations, and police customs and tradition/values and ethical standards. The expected release of NAPOLCOM exam results is after 2-3 months or anytime in December 2015 to January 2016. 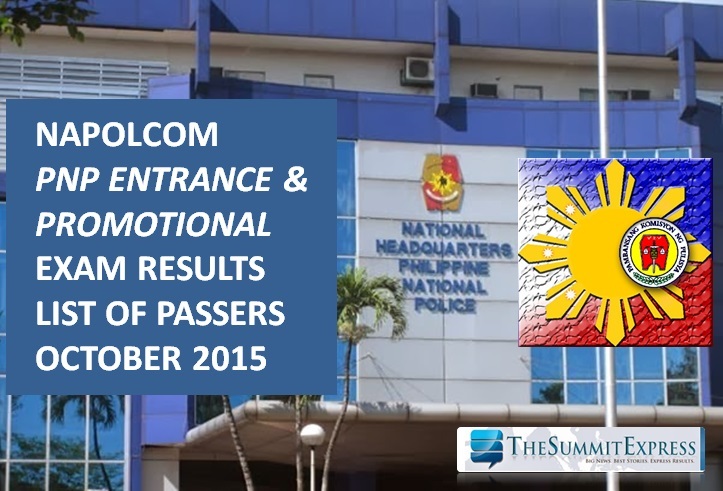 December 20, 2015 Update: NAPOLCOM readies results page for October 2015 exam. January 8, 2016: Partial results out online. Complete list of passers and top 20 for Police Inspector and Superintendent to be released soon. February 13, 2016: Full results officially released. Same with the previous exams, TheSummitExpress will continue to update this page for the exact release date. Be sure to Like Us on Facebook to receive updates.